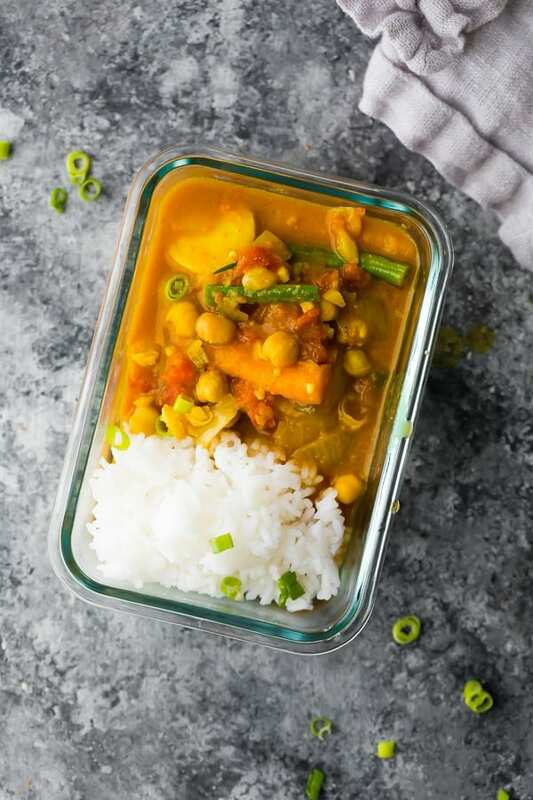 This Instant Pot vegan chickpea curry can be assembled ahead and frozen as a freezer Instant Pot meal, or frozen after cooking as a freezer-friendly meal prep lunch! Vegan, gluten-free, and so full of flavor. Say hello to my new favorite curry recipe! Full of flavor, and so easy to prepare, thanks to the Instant Pot! 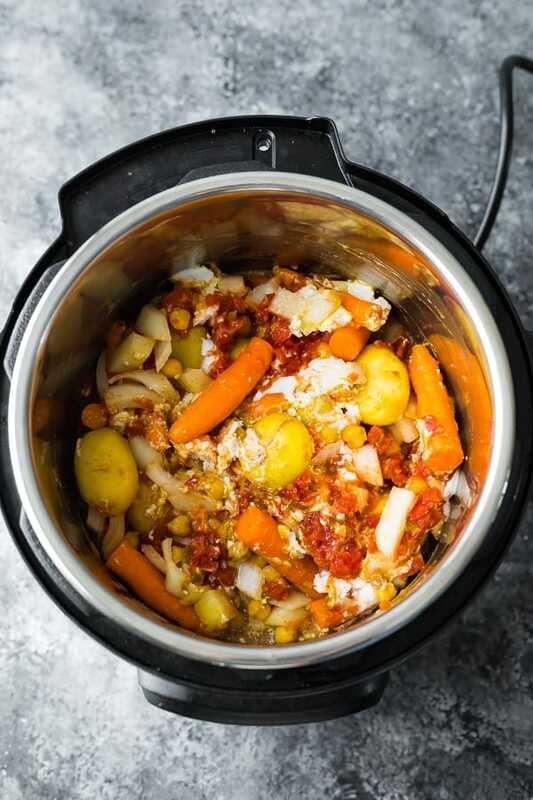 Not only does it require zero pre-cooking (you can literally just dump all your ingredients in the Instant Pot! ), but it doesn’t require much in the way of chopping, either! 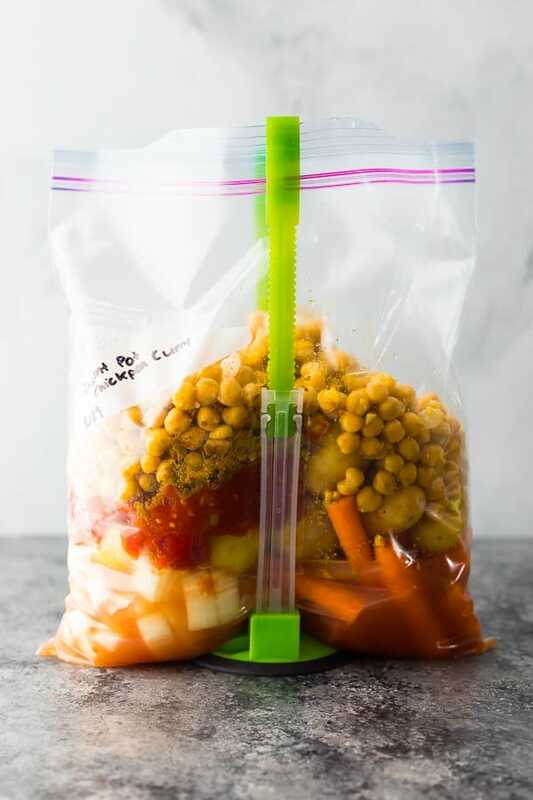 And the best thing about this chickpea curry recipe is that you can assemble all your ingredients and freeze. When you’re ready to cook, thaw completely, then dump everything in the Instant Pot and press ‘start’. Dinner has never been so easy! 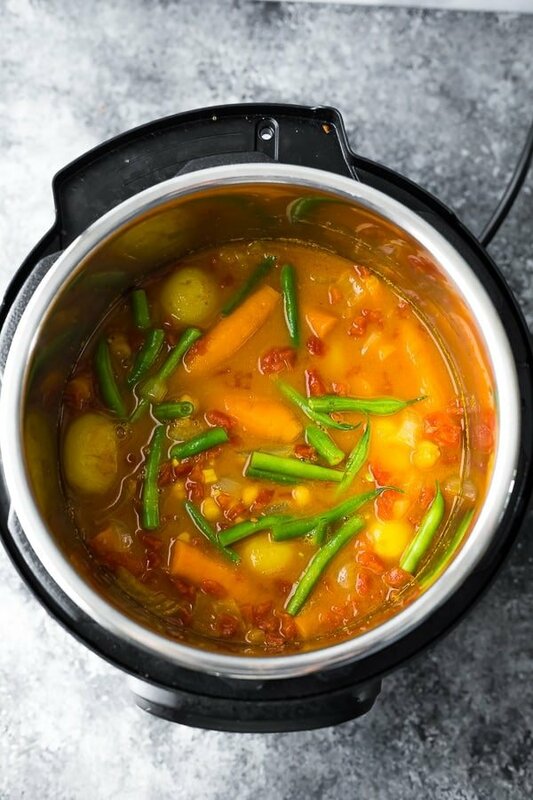 I was happy to get GREAT flavor out of this curry without having to use the sautee function of the Instant Pot, because this means it can be assembled ahead and frozen! Assemble all ingredients not labeled ‘after cooking’ in the Instant Pot or a heavy freezer bag (gallon-sized). Allow pressure to naturally release for 10 minutes after cooking. Stir in some lemon juice and the green beans. Allow to sit for 5 minutes until the green beans are bright green. What is a freezer Instant Pot meal? This refers to the practice of assembling your ingredients and freezing. When you’re ready to cook, simply thaw and cook as directed. Since you are cooking for the first time, it tastes fresh and just as delicious as pre-freezing. Do I add the green beans to the bag? Since green beans need to be blanched before freezing, and they may overcook in the IP, I added them to this vegan chickpea curry after cooking. Let them sit for 5 minutes before serving. Is this chickpea coconut curry spicy? My curry was not spicy at all. I used this mild curry powder, but if you’d like to up the heat, you could use a spicy curry powder, or add in some cayenne to the recipe. 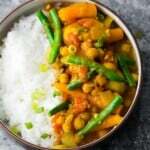 Can I cook this chickpea coconut curry in the slow cooker? I will be testing this soon. I’ve had issues with coconut milk breaking in the slow cooker, so I can’t say for sure that it will work. Can I add chicken to this chickpea curry recipe? Sure! I’d slice boneless skinless chicken breasts in half lengthwise, and boneless skinless chicken thighs in 1-inch cubes and cook as directed. 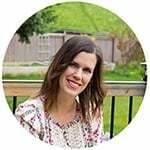 Looking for more vegan recipes? Try these Pineapple BBQ Tofu Bowls, this Vegan Ginger Teriyaki Stir Fry, this Chickpea Salad Bento Box, or this round-up with more than 65 Vegan Meal Prep Recipes! 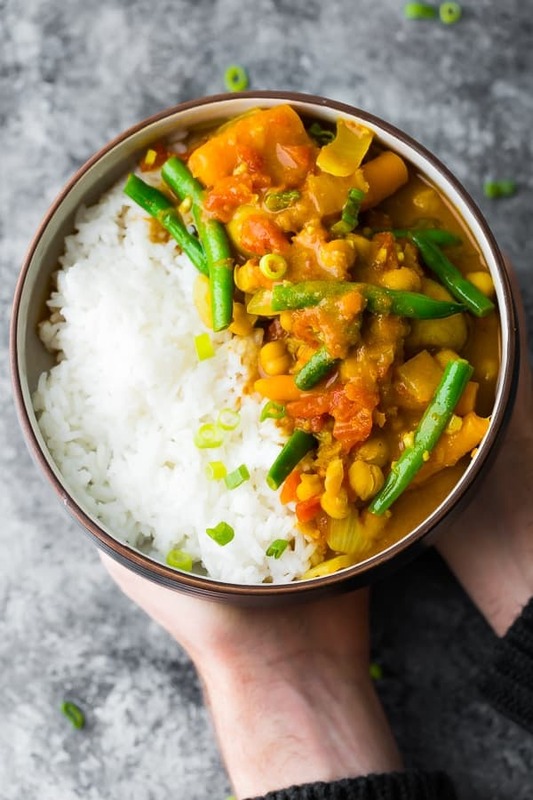 The BEST simple, fuss-free Instant Pot Chickpea Curry. No pre-cooking, simple ingredients, and you can even prep it ahead and freeze! Place all ingredients not labelled 'after cooking' in the Instant Pot. Seal the valve, then pressure cook on high for 5 minutes. The pot will take roughly 20 minutes to come to pressure. After cooking, let the pot sit for 10 minutes to let the pressure release naturally. Release remaining pressure, then stir in the lemon juice and green beans. Allow to sit 5 more minutes, until the beans are slightly soft and bright green. Place all ingredients not labelled 'after cooking' in a heavy duty gallon-sized freezer bag. Squeeze as much air as possible out of the bag. Freeze flat for up to 3 months. To cook, thaw completely, before cooking as directed above. Portion out into meal prep containers with 1/2 cup of rice. Cool completely, then freeze for up to 2 months. Thaw overnight in the fridge, then reheat until steaming hot in the microwave. Do you need to soak the chickpeas before cooking them this way? Thank you! 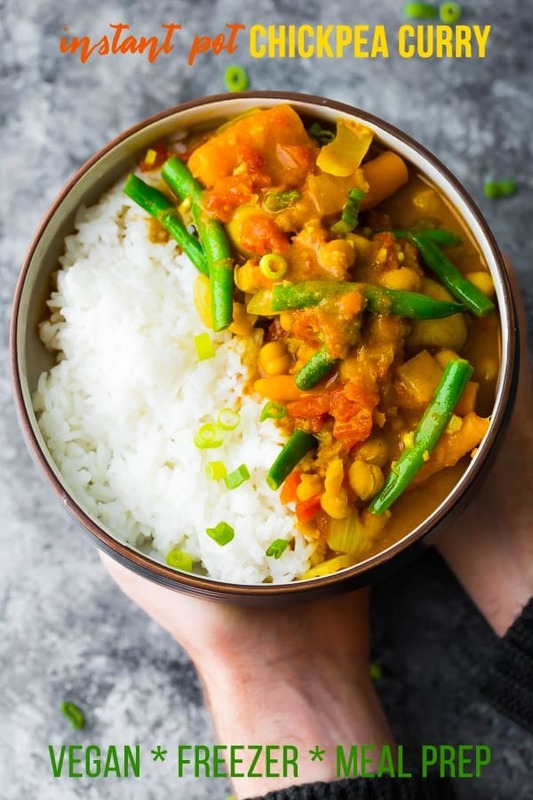 This was the best chickpea curry recipe I’ve tried, plus it’s so simple to make and healthy – thank you for sharing this!! 🙂 Really takes the stress out of busy weekday dinner prep. I am so happy you enjoyed it, Christina! Thanks so much for taking the time to leave a review! How to stove cook this? Hi Carmen! I haven’t made this on the stovetop, but I’d just throw it all in a pot and simmer for 30 or so minutes, until tender. I hope you enjoy!